I’ve been the only female in the press box. I’ve sat in a room full of men at press conferences. I’ve felt like I haven’t been taken seriously before. There are more like me, but I am definitely in the minority. It doesn’t bother me though. I knew going into the sports writing business that I would be different from almost everyone around me. I was often told that when looking for a job in the field, it could be an advantage. In a field dominated by men, organizations looking for diversity would take a special look at my resume. But I never wanted that. I don’t want to make it to the top of the stack just because I’m a girl. I want to make it to the top of the stack for my qualifications, for my writing. I don’t want to be treated differently because I’m a woman. I didn’t always pay much attention to the fact that I’m different from those around me when covering sporting events at Ohio University. There are other females around, but the sports reporting scene is still largely dominated by men. That was illustrated to me when Semeka Randall, the women’s basketball coach last season, pointed me out in a press conference. I was the only other female in the room. “I’m trying to figure this team out. You know, they’re women so you know how that goes,” she said of her team after a win over the Eastern Kentucky University Lady Colonels this past December. She looked right at me as my cheeks flushed red and all of the other male sportswriters laughed at her joke. I laughed too. I knew what she was talking about, but all of a sudden, I couldn’t ignore it anymore. During that stint covering the women’s basketball team, I learned a lot about sports writing and being a woman amongst men. I’ve never had a problem covering women’s sports. I never felt like it was a lesser assignment that was given to me because I’m a woman. I actually take pride in being able to bring coverage to teams that have less attention directed at them. Crowds pack into the Convo every winter, where the banners hang from the rafters above the court. Though men’s basketball titles are to be expected, especially in the past two years, there are banners that some might have missed. 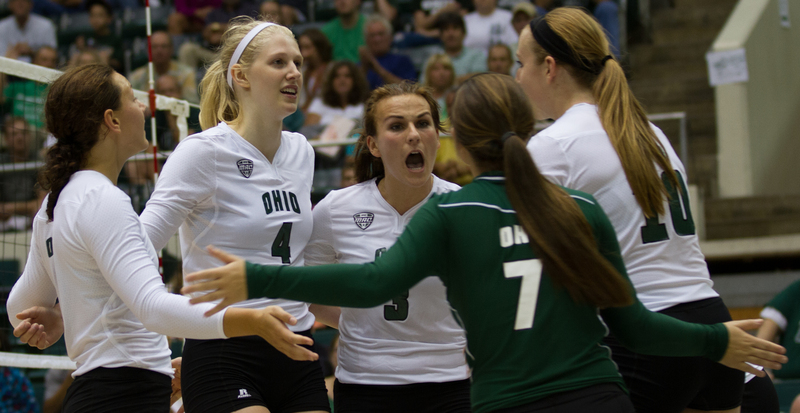 Take a look and you’ll see that the Ohio University Volleyball team has captured seven MAC regular season titles and have matched that number with MAC championship titles. And this year, they look to add another. Women’s sports often don’t get the attention of men’s and success is shrouded by the more popular big three sports, all dominated by men. That’s true for Ohio University women athletes, as with many universities across the country. Women’s athletics have shined in the past few years at Ohio, but are still overshadowed by the success on the gridiron and on the men’s basketball court. Students know Tyler Tettleton. They know Stevie Taylor. But what about Kelly Lamberti, the 2012 MAC Player of the Year for volleyball? Football and men’s basketball will always be first in the hearts of most American college athletics fans, but what will it take for women’s sports to get that kind of attention, or even close for that matter? I don’t mind being the only woman on a staff of men. I don’t mind being the odd one out. I don’t mind covering women’s sports. Being a woman sportswriter has given me a unique experience, but it’s been a good one. I know that I might face challenges in my future, but I’m not worried about them. And I don’t think I’ll always be the only woman in those press boxes and conferences.